Our state Capitol, where new tax ideas are being hatched. There are lots of things that could conceivably be taxed. But old cars? Clunkers driven by people who probably can’t afford to get anything new? 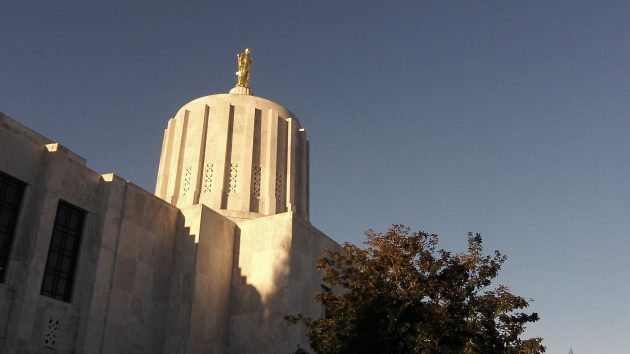 The House Revenue Committee in Salem has a proposed eight or nine bills that would raise Oregon taxes. Two of the more remarkable ones would tax old cars and coffee. House Bill 2877 would impose what the committee calls an “impact tax” on motor vehicles that are 20 years old or older. The tax would be $1,000 and would come due every five years. Just why the majority Democrats in the House want to hit poor people in Oregon with a thousand-dollar tax is far from clear. And what exactly is meant by the term “impact tax”? The money from the tax would go into the highway fund. Are they claiming old cars have a bigger impact on the roads than vehicles that are not that old? It’s not clear why coffee drinkers are the ones that are supposed to help pay for alternative education. How come tea drinkers are getting off free? Not to mention the drinkers of pop? The House Revenue Committee has other tax proposals. Among them are bills to increase the income tax rate on higher incomes and phase out itemized deductions, including deductions for property taxes. And of course there are bills to raise the corporate excise tax and the corporate minimum tax. And then there is House Bill 2769. That one would impose a sales tax on the sale of art, collectibles and furniture if the value amounts to $100,000 or more. This is ridiculous, so all you liberal idiots best start paying attention on who and what you’re voting for because it is at the point that it has run amuck, out of hand. These things are completely ridiculous, and I mean really ridiculous. Vote the liberals out of office or you will be in debt your entire life and will be taxed into poverty. If a coffee tax how about a tea tax or one on hot chocolate, and bottled water, juice, etc. So people that have a collection of old cars would have to pay $1000 per car???? Yup, unless the cars are registered as antiques, in which case they would be exempt. It is difficult to know whether Hasso is angry about tax futures, or is he secretly pleased, as a bicycle fiend, to see any and all taxes on cars, young, old or otherwise. Too early in the session. A lot of weed seed in the grain until it gets sorted and cleaned. The car bill won’t make it out of committee. I see some new curmudgeons railing. Good news! In my search for the other 6 or 7 ideas another blog reports the old car tax idea is dead. At first glance, I envisioned old rust buckets sitting around one’s property as the weeds grow around and inside. Tax avoidance incentive to clean up said property. C’mon we’ve all seen these. However, if the older vehicle is functional and used more often than not does seem as a cash grab. Yeah, I have to believe they are spit balling ideas…bad and otherwise. Now back to my search. Chill folks… The vast majority of bills never make it out of committee. Many are simply thrown out there knowing full well they won’t go anywhere. Why? More than one legislator has offered a bill as a potential bargaining chip. More than one legislator has offered a bill believing it has some merit and genuinely wants to see if they can march it through the process. But why a committee, not an individual lawmaker, would have a nonsensical bill drafted and introduced is hard to understand or defend. To repay a favor or to grant one in exchange for a future one. That’s how our form of government actually works. How else did LBJ get the Voting Rights Act past the entrenched Southern Senators? Why? Easier to hide In a herd? I certainly prefer them spending time on things that won’t pass. Maybe our conservative legislators can help prolong the process of their demise to prevent worse legislation from passing.